The first annual American Cancer Society Relay For Life® of Mill Creek raised $49,796 to support the Society’s mission of saving lives from cancer, leaving hundreds of volunteers exhausted, but happy, after walking throughout the overnight event at McCollum Park June 2 and 3. According to Event Chair, Mike Todd, donations are still being accepted. “Through their hard work in preparing for the event, and by spending hours walking for the cause, greater Mill Creek residents certainly did their part to help the American Cancer Society create a world with less cancer and more birthdays," said Mike Todd, volunteer chair for the 2012 Relay For Life of Mill Creek. The top fundraising teams were Merrill Gardens with $6,624 raised, followed by Papa Murphy’s at $4,669. Donations made through August 31 at RelayForLife.org/MillCreekWA will count towards the Mill Creek event goal, so please donate today. Twenty-six teams, comprised of area families, faith-based groups, businesses, clubs and other organizations, participated in this year’s Relay event. Hundreds of others came by to participate in the event, which included recognition for cancer survivors, entertainment by local bands and performance groups, and a variety of on-site activities. “Hundreds of people in our community alone will face a cancer diagnosis this year,” said Todd. “It’s important that we come together during Relay to help the American Cancer Society achieve its mission of saving lives by helping people stay well, by helping people get well, by finding cures and by fighting back." 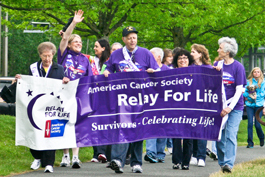 To learn more about Relay For Life, visit www.RelayForLife.org or call 800-227-2345.